Elmendorf Air Force Base, Joint Base Elmendorf–Richardson, Alaska, U.S. Established on 28 December 1941 as the Alaskan Air Force at Elmendorf Field, Alaska Territory. 11 AF was a United States Army Air Forces combat air force in the American Theater of World War II, providing air defense of Alaska and engaging in combat operations primarily in the Aleutian Islands and Northern Pacific during the Aleutian Islands Campaign. Re-designated as Alaskan Air Command in late 1945, the organization became responsible for the air defense of Alaska during the Cold War. With the collapse of the Soviet Union, the organization was realigned under PACAF in 1990 and returned to its previous Numbered Air Force command echelon. The commander of the Eleventh Air Force also serves as the commander of United States Northern Command's sub-unified Alaskan Command, and as commander of the Alaskan North American Aerospace Defense Command Region. This mission is accomplished largely through the PACAF Regional Support Center (PRSC), the 611th Air and Space Operations Center, and units of the Alaska Air National Guard (AKANG). Together, they provide a network of critical air surveillance and command, control and communications functions necessary to perform tactical warning and attack assessment in defense of Alaska. The 3d Wing is a United States Air Force unit stationed at Joint Base Elmendorf–Richardson, Alaska. Its mission is to support and defend U.S. interests in the Asia-Pacific region and around the world by providing units that are ready for worldwide air power projection and a base that is capable of meeting PACOM's theater staging and throughput requirements. The 354th Fighter Wing is stationed at Eielson Air Force Base, Alaska. The wing's mission is to train and provide F-16C and Expeditionary Combat Support forces to combatant commanders anytime, anyplace, in support of U.S. national security objectives. As the United States Air Force’s most northern operational wing, the 354th Fighter Wing also hosts Air Education and Training Command’s Arctic Survival School. The 36th Wing's and Andersen Air Force Base's official mission statement is "...to employ, deploy, integrate and enable air and space forces from the most forward US sovereign Air Force Base in the Pacific." More simply, the 36th Wing has three major missions: Operate Andersen AFB via its subordinate 36th Mission Support and 36th Medical Groups; Provide power projection through an attached, rotational bomber force via its subordinate 36th Operations and 36th Maintenance Groups; and provide rapid air base opening and initial air base operation ability via its subordinate 36th Contingency Response Group. The 611th Air and Space Operations Center at Joint Base Elmendorf–Richardson, Alaska consists of five squadrons and two numbered flights that develop plans, procedures and directives for the employment of Alaskan combat and support forces assigned to the 11th Air Force, PACAF and NORAD. The 611th Air Support Group at Joint Base Elmendorf–Richardson, Alaska consists of two squadrons that provides surveillance radars, Arctic infrastructure including airfields, communications and worldwide ready EAF warriors for homeland defense, decisive force projection, and aerospace command and control in Alaska. The 168th Air Refueling Wing is an Air National Guard stationed at Eielson Air Force Base, Alaska, and flies the Boeing KC-135R Stratotanker. The 168th also has taken over the missile defense mission at Clear Air Force Station with their 213th Space Warning Squadron. The 176th Wing is an Air National Guard unit operating out of Joint Base Elmendorf–Richardson in Anchorage, Alaska. The 176th is a multifaceted organization consisting of an airlift squadron, a complete pararescue package, as well as the 176th Air Control Squadron, which supports the Alaska NORAD Region with continuous operations and maintenance. Military aircraft began flying in Alaska in 1920 when the Black Wolf Squadron, or The Alaska Flying Expedition, made The New York to Nome Flight. Capt. St. Clair Streett commanded 7 men in 4 DH-4s as they took off from Mitchel Field on 17 July 1920. Each plane had a black profile of a Wolf's head painted on their sides. The trip organizer, Billy Mitchell wanted to establish an airway to Alaska and Asia. The 9349 mile round trip route included flying west to North Dakota, then north through Saskatchewan, Alberta, British Columbia, the Yukon, and onwards to Fairbanks on 19 Aug. and finally Nome on the 23rd. They started their return trip on the 31st, landing Mitchel Field on 20 Oct. 1920 after 112 flying hours. In 1924, the around the world flight by the Army using Douglas "World Cruiser"s also transited though Alaska. However, the first permanently based military aircraft began to deploy to Alaska during the last half of 1940 after the breakout of World War II in Europe and tensions began to deteriorate with Japan. To coordinate air activities there, the Alaskan Defense Command established the Air Field Forces, Alaskan Defense Command on 29 May 1941. The first "troops" of the Alaskan Air Force advance echelon to arrive in Alaska included a six-year-old Martin B-10 on 12 August 1940. On 12 December the Army designated the base Fort Richardson and flying field Elmendorf Field. The post was named for Brig Gen Wilds P. Richardson, former head of the Alaska Road Commission; the airfield and flying facilities were named Elmendorf Field in honor of Captain Hugh M. Elmendorf, killed in 1933 while flight testing an experimental fighter near Wright Field, Ohio. The first Air Corps unit to be assigned to Alaska was the 18th Pursuit Squadron, which transferred to Elmendorf from Hamilton Army Airfield, California on 21 February 1941 with Curtiss P-40 Warhawks. The 23d Air Base Group was assigned shortly afterwards to provide base support. The 36th Bombardment Squadron arrived less than a month later from Lowry Field, Colorado, equipped with Douglas B-18 Bolo medium bombers. An extremely fortunate accident took place in October 1941, which possibly changed the whole course of World War II in Alaska. Equipment for the construction of a CAA-DLA (Civil Aeronautics Authority-Defense Land Appropriation) airfield at McGrath, on the mainland, arrived too late to begin construction of the field, since the ground already had become frozen, and General Buckner requested and received permission to divert the equipment and men to Cold Bay on the Alaskan Peninsula and Otter Point on Umnak Island, to build two airfields for the defense of the Naval Base at Dutch Harbor. To conceal their purpose, both fields were organized as ostensible business enterprises concerned with fishing and canning. The two cover names were: "Blair Packing Company" and "Saxton & Company", whose peculiar canning equipment consisted of bulldozers, power shovels and similar construction equipment. The top holding-company for these enterprises was the "Consolidated Packing Company" of Anchorage, known in military circles as the Alaskan Defense Command. Security was complete. Japanese intelligence never learned of the existence of these airfields and the Japanese tactical decisions were based on the assumption that their attack on Dutch Harbor would not be opposed by land-based aircraft. All through the winter of 1941–1942, men worked at the construction of these two air bases, and by spring, two 5,000-foot airstrips were completed, one at Cold Bay (Fort Randall Army Airfield), the other at Otter Point on Umnak (Fort Glenn Army Airfield). Another vital factor in the construction of the Umnak field was the use of perforated steel matting. No other medium could have been used to build that runway in the time required, since Umnak has no natural construction material. The matting was laid over a graded gash in the tundra and set the pattern for the construction of future Aleutian runways. Administratively speaking, the Eleventh Air Force also was born in that winter of 1941–1942. First conceived as the Air Force, Alaskan Defense Command, it emerged as an integral unit as the Alaskan Air Force on 15 January 1942, and was redesignated the Eleventh Air Force on 5 February. In May 1942, a field headquarters was established at Fort Morrow Army Airfield, Port Heiden, Alaska, and planes of the 73d Bombardment Squadron were deployed at Fort Randall Army Airfield, Cold Bay and the 21st Bombardment Squadron at Fort Glenn Army Airfield, Umnak. When the first inklings of a possible Japanese attack on the Aleutian Islands were known, the Eleventh Air Force was ordered to send out reconnaissance aircraft to locate the Japanese fleet reported heading toward Dutch Harbor and attack it with bombers, concentrating on sinking Hosogaya's two aircraft carriers. Once the enemy planes were removed, Task Force 8 of the Navy would engage the enemy fleet and destroy it. On the afternoon of 2 June a naval patrol plane spotted the approaching Japanese fleet, reporting its location as 800 miles southwest of Dutch Harbor. Eleventh Air Force was placed on full alert. Shortly thereafter bad weather set in, and no further sightings of the fleet were made that day. By mid-June the Joint Chiefs of Staff theorized that the attack on the Aleutian Islands and the occupation of its westernmost islands might be part of a holding action designed to screen a northward thrust by Japanese forces into Siberia's maritime provinces and the Kamchatka Peninsula. As a result of their concern about a possible Japanese attack upon the Soviet Union that might also include the occupation of St. Lawrence Island in the Bering Sea and of nearby Nome and its adjacent airfields on the Alaskan mainland. Supporting the possibility of an invasion of the Alaskan mainland were reports of a Japanese fleet operating in the Bering Sea. Three separate sightings placed an enemy fleet somewhere between the Pribilof and St. Lawrence Islands, suggesting that either an enemy raid on or an outright invasion of the Alaskan mainland was imminent, with Nome the likely objective. As a result, within thirty-six hours, Eleventh Air Force using commandeered civilian aircraft flew nearly 2,300 troops to Nome, along with artillery and antiaircraft guns and several tons of other equipment and supplies. Consolidated B-24 Liberator bombers of the 404th Bombardment Squadron were sent to the Air Transport Command Marks Army Airfield with a mission to locate and attack the Japanese Fleet. Not until late July when United States intelligence reported with some certainty the departure of Hosogaya's fleet from the Bering Sea did the threat of invasion of the Alaskan mainland decline, allowing for the redeployment of many of the troops hastily assembled at Nome. Throughout the winter of 1942–1943, the Eleventh Air Force bombed Kiska and Attu whenever possible, although the flyers were extremely handicapped by the almost constant fog which covered the island. At the same time, the bases to the east of Adak were consolidated and built up. In October, the Field Headquarters of the Eleventh Air Force was closed at Kodiak and moved to Davis AAF. By March, both medium and heavy bombers could make the short hop from Amchitka to Kiska and on good days, rare enough, crews flew as many as four and occasionally six sorties per day. It was said that the Japanese needed no air warning system on Kiska, because they could hear the Eleventh Air Force bombers warming up on Amchitka, and knew from the sound of the engines when the raids were taking off. Throughout this period, the striking power of the Eleventh Air Force included only three squadrons of medium bombers, three squadrons of heavies and four squadrons of fighters. An additional squadron of P-39 Airacobras operated in the Aleutian theater for a short while, but their light landing gear was unsatisfactory for use on the rough fields and they were returned to the States. On 1 April, a plan to by-pass Kiska and capture Attu was presented to the Joint Chiefs of Staff, was approved, and on 11 May, American troops went ashore on Attu. In a short and fierce battle, the Japanese garrison was wiped out, and on 29 May, the island was declared secure. The first plane, a hospital C-47, landed on a newly completed runway at Alexai Point Army Airfield, Attu, on 7 June. The operation against Attu also included the occupation of the Semichi Islands, an archipelago of three tiny bits of land some 35 miles east of Attu. The flattest of these, Shemya, was to be the site of the most important American air base for future operations. Barely four miles long and only two miles wide, Shemya Army Airfield became, literally, a stationary aircraft carrier. These islands were taken without opposition, on 29 May. With Kiska cut off by the occupation of Attu, the Japanese made plans to evacuate the Aleutian Islands. Numerous sorties were made by the Japanese Fifth Fleet, based at Paramushiru, but finally on 28 July, under cover of a thick fog, destroyers were able to enter Kiska Harbor and remove all occupation troops. When American troops went ashore on 15 August, the island was deserted, ending the Aleutian Campaign. Six million pounds of bombs had been dropped on Kiska and Attu in Eleventh Air Force operations. The Japanese had been prevented from building an air field and from bringing in reinforcements. 'Rufe' seaplane fighters were shot out of the air as soon as they came up to give combat. Air Force fighters and bombers had played an instrumental part in driving Japanese out of the Aleutian Islands. Illustrative of the challenges omnipresent in Alaska, only 35 aircraft were lost in combat compared to 150 operational accidents. It was the highest American combat-to-accidental loss ratio for any theater in World War II. Weather was the prime culprit. The Eleventh Air Force accounted for approximately 60 Japanese aircraft, one destroyer, one submarine and seven transport ships destroyed by air operations. More than a month before the unopposed landing on Kiska, the Eleventh Air Force began a new phase of operations against the Japanese. On 10 July 1943, six Eleventh Air Force B-25 Mitchells made the long flight to Paramushiru Island in the Kuriles and made the first direct attack on the Japanese home islands since the famous Doolittle raid in April 1942. From Alexai Point AAF on Attu, eight Mitchells of the 77th Bomb Squadron. (28th BG) struck Paramushiro bases principally. All returned safely. Several changes took place following the occupation of Kiska. The Eleventh Air Force became a component of Task Force "Y", still under Navy jurisdiction. Vice Admiral Frank Jack Fletcher was named ComNorPac and Major General Davenport Johnson relieved General Butler as commander of the Eleventh Air Force. One of General Johnson's first acts was the establishment of the Eleventh Air Force Instrument flying school and the promotion of an intensive training program in navigation and instrument flying, as well as the accelerated development of radio and navigation aids in the Aleutian Islands. Because of the tremendous advances brought about by intensive instrument training and the increased aids to navigation and radio, planes that used to be grounded by weather, were now flying regular schedules. Troop Carrier Command and Air Transport Command planes were operating in the Aleutian Islands with airline regularity. In November 1943 a second airfield, Casco Cove Army Airfield was constructed on Attu for long-range bombing operations. Eleventh Air Force carried out another bombing mission against northern Kurils on 5 February 1944, when it attacked with six B-24s from the 404th Bomb Sqdn. (28th BG) and 16 P-38s from the 54th Fighter Sqdn. (343d FG). March 1944 saw Eleventh Air Force bombers over the Kuriles on daylight armed reconnaissance missions. Not many, but a sufficient number to convince the Japanese that there were aircraft in the Aleutian Islands and that the Kuriles were in constant danger of air attack. During the crucial period, while other United States forces were advancing in the South Pacific, the Japanese were forced to keep much-needed aircraft, in the Kuriles and Hokkaido as defense against possible attack from the North. The B-25 Mitchell medium bombers, too, were playing their part in operations against the Kuriles. They had been kept on shipping alert since the abortive 11 September raid, but in May, two planes on a gasoline consumption test west of Attu, discovered and sank two armed Japanese trawlers. From that time on, the Mitchells, made sweeps against shipping when weather permitted, and by fall were bombing land targets in the Kuriles. ATC also developed two transport routes to Alaska during the war to support Eleventh Air Force. The first was from McChord Field, near Seattle, Washington north along the British Columbia coastline to Annette Island, then to Yakutat and into Elmendorf AFB. The second was developed to support the Aleutian Campaign and was built as American forces moved westward along the island chain. It started in Anchorage and went through Nannek Airfield then to Point Heiden, Cold Bay and along the Aleutian Islands until reaching Shemya and Attu Islands in 1944. These transport routes ferried personnel, along with high-value equipment and supplies that could not be shipped by normal cargo sealift. This eventually extended to Hokkaido, Japan after the end of the war, the route becoming part of the Great Circle Route from Japan to the United States. Much of the transport along the routes were an airline responsibility, with Northwest Airlines and Western Airlines operating the routes under contract. It took these actions due to the fact that only two bomber squadrons remained in the Eleventh Air Force and the need to reduce the number of personnel. The 28th Bombardment Group on Shemya and the 343d Fighter Group at Alexai Point AAF, Attu, assumed the responsibilities of the two commands. The 404th Bombardment Squadron was responsible for conducting night reconnaissance missions over the Kuriles and flying a daily weather reconnaissance flights. The 77th Bombardment Squadron was held in readiness to repel a seaborne invasion and the fighter squadrons provided air defense. Air Corps supply and fourth echelon maintenance was carried on at the Alaska Air Depot at Elmendorf, and the normal paper-work, customarily handled by a Service command, devolved upon the Eleventh Air Force Headquarters. Eleventh Air Force, sent between 24 August and 4 September 1945 two B-24 Liberators of the 28th BG flew reconnaissance overflights over the North Kuril Islands to take photos of the Soviet occupation in the area. Soviet fighters intercepted and forced them away a foretaste of the Cold war that lay ahead. Americans planners had briefly contemplated an invasion of northern Japan from the Aleutian Islands during fall of 1943, but rejected that idea as too risky and impractical. They considered the use of Boeing B-29 Superfortresses, on Amchitka and Shemya Bases, but rejected that idea too. U.S. military maintained interest in these plans when they ordered the expansion of bases in the western Aleutian Islands, and major construction began on Shemya for a possible invasion of Japan via the Northern route in 1945. The real nature of the Aleutian Islands the value of the Eleventh Air Force to America was known but not confirmed until 3 September 1945. On that day, a C-54 piloted by Major G. E. Cain, filed a flight plan at Atsugi Airdrome, near Tokyo, Honshū, Japan. Twelve hours later, he landed at Adak, refueled and took off for Seattle. He landed in Washington after 31 hours of flying time, with the first motion pictures of the Japanese surrender the previous day. With the end of the war, many of the small air bases in the Aleutian Islands closed permanently, and postwar emphasis turned to training. Air Transport Command transferred Ladd Field to the Eleventh Air Force on 1 November. On 15 December 1945, The Army reorganized its organization in Alaska. Eleventh Air Force, which was under the jurisdiction of the Army Western Defense Command, headquartered at the Presidio of San Francisco since its establishment in 1941, was transferred to the jurisdiction of the United States Army Air Forces. Under the USAAF, it was re-designated as Alaskan Air Command' on 18 December 1945, without any change in headquarters location. Alaskan Air Command was established at the same Major Command echelon as the other overseas combat commands, the United States Air Forces in Europe, Far East Air Forces and Caribbean Air Command, with its mission being the air defense of the Territory of Alaska. Six months after Eleventh Air Force had been redesignated in Alaska, another headquarters, also named Eleventh Air Force, was established on 13 May 1946 and activated at Olmsted Field, Pennsylvania, on 13 June 1946. This new organization was assigned to Air Defense Command. Major General Thomas J. Hanley, Jr. took command, and a cadre of enlisted personnel arrived at Olmsted on 19 June 1946. The headquarters was relocated to Harrisburg, Pennsylvania on 9 August 1946, base units were assigned and training commenced for reserve and National Guard units in Indiana, Ohio and Pennsylvania. Training continued until the unit was inactivated on 1 July 1948. This organization was to have been activated on 1 July 1962 at Travis Air Force Base under Military Air Transport Service, but that action was revoked three days before it became effective. This unit is not related to the current Eleventh Air Force. Its major units also changed. At Elmendorf AFB the 21st Tactical Fighter Wing was inactivated and was replaced by the 3rd Wing transferred from Clark AB in December 1991 due to the destruction of Clark AB by the Mount Pinatubo eruption. The F-15E Strike Eagle-equipped 90th Fighter Squadron was added as were the 517th Airlift Squadron (C-130Hs and C-12Fs) and the 962d Airborne Air Control Squadron (E-3B). There were also significant changes at Eielson AFB, when on 1 September 1992, Strategic Air Command inactivated the 6th Strategic Reconnaissance Wing, assigned there in 1967. The 343d Composite Wing became the host unit. 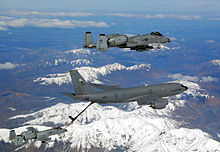 The Fairchild Republic A-10 Thunderbolt II assigned to the 18th Fighter Squadron were replaced with General Dynamics F-16 Fighting Falcons in 1992 and an OA-10A squadron was activated. Eielson AFB became home of the Exercise Cope Thunder series, and the Alaskan range complex was greatly expanded and improved to accommodate not only Cope Thunder but other joint training requirements as well. see 611th Air Support Group for a list of the AN/FPS-117 radar sites. Under Alaskan Air Command, aerospace forces were built up in the 1950s and 1960s in response to a long-range bomber threat. In the late 1960s and early 1970s, concern shifted to the strategic ballistic missile threat and active air defenses were reduced. The appearance of a strategic cruise missile threat once again prompted a buildup of air defense capabilities. The Alaska NORAD Region Air Operations Center (AKRAOC), operated by U.S. and Canadian personnel, became operational in 1983 at Elmendorf AFB which receives and analyses surveillance radar data from the sites in the Alaska Radar System (ARS) to determine range, direction altitude speed and whether or not the objects are friendly or hostile. Under authority from Western Defense Command, the Alaska Defense Command replaced the Air Field Forces, Alaskan Defense Command, with the Air Force, Alaskan Defense Command, on 17 October 1941. Neither the Air Field Forces nor the Air Force, Alaskan Defense Command, were legitimate War Department establishments and must be classified in the same category as provisional units, although the term "provisional" was never used in connection with them. Construction began 21 September 1941, activated 4 July 1942; a.k.a. Bethel Air Base; Used by Air Transport Command as auxiliary airfield for Lend-Lease aircraft being flown to Siberia; Transferred to Eleventh Air Force, then to Alaskan Air Command, 1945; became joint-use Bethel Airport, used for construction of AC&W Bethel Air Force Station in the mid-1950s. Full jurisdiction turned over to Alaska Government 1958, now a civil airport. Emergency 3,000 ft rolled gravel landing strip bulldozed in 1943, located adjacent to Gakona, Alaska, aligned 03/21. Abandoned after the war, now the right-of-way is a part of Alaska Highway 1. Captured Japanese airfield under construction at time of liberation, 1943. Completed by AAF Engineers and used as auxiliary transport airfield in Aleutian Islands. Closed 1945 and abandoned. Report from the Aleutians 1943 film by John Houston about the daily lives of the servicemen at Adak Airfield. ^ This unit is not related to the Eleventh Air Force headquartered in Pennsylvania described below. ^ Cohen, Stan (1998). Alaska Flying Expedition. Missoula: Pictorials Histories Publishing Co., Inc. pp. v, 1–2. ISBN 9781575100418. ^ "Abstract, History of Eleventh AF, activation-Dec 1946". Air Force History Index. Retrieved 28 May 2012. ^ "Abstract, History of Eleventh AF, Jan-Jun 1948". Air Force History Index. Retrieved 27 July 2017.